It had been a very long, lonely, scary Saturday. It actually had begun on Friday at sundown. It was Sabbath – a day quite set apart from the other six in a week. The darkness was eerily quiet, a quiet that was like no other. Everything seemed to be suspended in a place that held no time or reference that a human mind could fully explain. It was natural during this dark night that ones mind would turn with rapid and unfocused speed to many different thoughts. Sleep was not possible, so there was really nothing else to do but sit and contemplate. Thoughts, quite naturally, turned to another still and quiet night. A night in which the darkness was pierced by a bright star glowing in the heavens with a singleness of purpose. That particular night was about shepherds, angels singing of the glory of God and the gentle cries of a new born baby suddenly breaking the quiet with the proclamation of redemption, possibility and a new hope for humankind. Tonight, there would be no such sudden cry. After what had seemed endless hours it was suddenly time. The first faint glow of light was beginning to break through the heavenly sky and at last reveal the faintest beginnings of a new day. What would it hold? What would this day bring? One of pro-found grief and sorrow was all that one could think would be possible after the events of several days ago. And so, some devoted, loyal and faithful women approached what had once been a cave. They walked slowly for the weight of their grief hung upon them. Their pain felt like splinters of wood piercing their hearts. Their hands ached in anguish as if huge nails had been driven into them. It was a deep reminder of what had happened and why they were now coming as they were to this place. With each step they came closer to their destination and with each step the light became a little brighter. Suddenly something did not seem, nor feel, right. Had they come to the right place? It was not at all as they had left it. The entrance of the cave, where once there had been placed a huge stone, was now wide open. The stone that had been rolled to block that opening was now off to the side exposing the entrance. Had someone already come and opened the cave, this borrowed tomb of death, so that the women could enter and prepare the body that had been left inside for burial? The women slowly approached, not exactly sure what was going on. The light was beginning to brighten and the women could suddenly see into the tomb. Where there had once been the darkness of death there was now light and they could see that the body was no longer where it had been left. What did remain was a white linen cloth that had once wrapped the body in a cocoon-like manner of repose. Without another word they both ran back in the direction of the tomb, but Peter arrived first and stopped suddenly when he saw that what she had said to him was true. The cloths that had wrapped Jesus were lying a bit disheveled on the ground and the cloth that had covered his head was rolled and set neatly off to the other side. Without another word Peter, and another disciple who also ran and met him at the tomb, left, and slowly walked away in silence. Mary, alone and staring into the tomb now totally filled with the light of the new days sun, suddenly heard a lone voice calling to her, saying, simply, “Mary.” And she knew at once that it was her Lord. 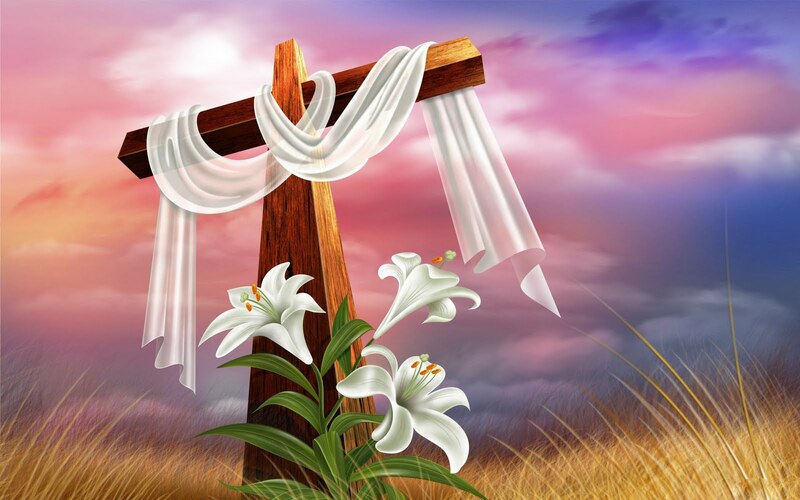 He had risen and was no longer dead, no longer a slave to the darkness of the tomb, but alive. At once the piercing pain of the splinters she had felt in her heart, and the sorrow and anguish of nails driven into her palms was lifted. Mary was unable to speak, unable to move, but she knew at that moment that everything in the world was now changed. Easter is about resurrection. It is about new hope in the light of a new day. It is about being released from the scary darkness of what had been – and into the light of what can now be. It was to Peter that Mary first announced the risen Lord. Her announcement to him set in motion a world altering chain of events. Peter would at that moment begin to take in what had happened. To suddenly reflect back to all that Jesus had ever said and all that Jesus had ever done. It had been to Peter that Jesus had proclaimed that through him he would build his church. This same Peter who had walked toward Jesus on a raging sea. Peter, who when asked by Jesus, “who do you say that I am? had replied, “You are the Messiah, the Son of the living God.” This same Peter who had been rebuked by Jesus when he said Jesus must never suffer and die, and Peter, who would deny knowing Jesus three times on the night that Jesus is led away to be falsely accused of treason. Now it is this self-same Peter who understands the miracle of resurrection. Now, in 2016, we are called to be among those witnesses. Now, through our faith and belief we are called to proclaim resurrection. In the place of sorrow and pain to see renewal. In the place of weeping to hear the Angels sing. In the place of faces flushed with tears to experience renewal, purpose, understanding and freedom. Resurrection is about life. Living life fully, and completely, each and every moment. In the face of adversity roll back that stone of sorrow and let the light of resurrection lead you in joy to what is next for you. We are witnesses to resurrection as we breathe life. We are witnesses when we see possibility where others would see defeat, and we are witnesses when, upon hearing the sounds of nature all around us, we affirm that God is now and forever a God of perfect creation. We are witnesses by forever being in awe and wonder to all that God is doing in the world. Death never has the last word. Spirit is never broken – it may change how it is to be experienced – but a Resurrection Spirit will live forever in the actions and words of those who accept it and see Its possibility for everyone. The gospel of Mark tells us a beautiful story of Jesus baptism. Jesus emerges from the water and we read, “And just as he was coming up out of the water, he saw the heavens torn apart and the Spirit descending like a dove on him. And a voice came from heaven, “You are my Son, the Beloved; with you I am well pleased. The image of coming out of the water for each of us can represent that release of all those things that hold us back, cause us to have feelings of defeat, or keep us in a state of constant stress. Coming out of the water represents our letting go of the old, the worn out, and the no longer relevant for us. Coming out of the water also represents a powerful affirmation to ourselves that we have a willingness to see life in a new way, live life in a new way, and share that example of new life with others. We are by virtue of that “resurrection” from the old way of life then entering into the light of a new experience. This new light exposes our old limited thinking and provides for us a marvelous opportunity to set before us a new course. Many people do not remember their baptism for they were infants. Several of us grew up in churches that practiced believer’s baptism by immersion. Either way, we can have a new baptism through the power of our thinking. Our thoughts are powerful, our intentions are creative and when we seek Spirit God’s direction the lives we co-create with God are beautiful. We can follow the example Jesus set before us by prayerfully answering God’s call to be a force in the world for good, peace and reconciliation. The decisions and thoughts we have today will create our tomorrow. So there is something to consider in that your present, your future, your today and your tomorrow are completely interwoven. Easter has passed. The Lord has risen. Now what? It is time for us to respond. It is time for us to begin to look at things in a different way. If we want the outer appearances of our lives to be changed we will need our spirit to be changed, to be altered, to be healed and renewed. This I like to call “resurrection thinking.” Thinking that doesn’t dwell on the darkness, the burdens and the heaviness of life, but thinking that calls forth a new faith, a trust and belief in God that turns us in the direction of His wondrous Light. Thinking that even in the dark night of ones soul still knows that darkness is never the final word. A knowing that even though there is the cross, that it was not then – and it is not now – the end of the story. Look at the cross on the wall of our sanctuary. The Christ is not there. “Resurrection thinking” sees the possibilities of life for in “resurrection thinking” we see that God has indeed renewed within us a steadfast and willing spirit. “Resurrection thinking” changes our conscious awareness so that we may see all things in a new and more powerful light. “Resurrection thinking” changes our awareness of the spirit in, through, around and as us, and when we do that all else in our lives naturally flows. The Christ has risen and all things are made new. A stone is rolled away. That which would separate death from life has been removed. No more is there a divide. Jesus so beautifully taught us to pray, “On earth as it is in heaven.” And on Easter he has demonstrated that very thing. He demonstrated it because he himself knew that for heaven to be on earth he would have to bring it forth. Though the women at the tomb that morning may have been perplexed by what they saw they had to be aware that something they had experienced in those moments would stay with them forever, that something extraordinary had changed and that they were a part of that change. Suddenly, the removal of that stone magnifies the message that though the things of the earth had previously been limited, the things of heaven are not. How do we open ourselves up to allowing this new experience to become our new reality? Are we willing to roll away the stones of our doubt, the stones of our believing that things must always be as they have always been for us? Are we willing to roll away the stones of our worries, our mistrust, our pain and our unbelief? Now we can affirm and know the Christ has created a new heaven and a new earth and they are, through his resurrection, brought together – brought together that our life upon this earth might have new meaning and a new purpose and a greater reality of Christ’s indwelling presence. Christ is risen; he is no longer in the tomb. May this resurrection spirit be the new energy that guides and directs our lives. It can be, if we will accept it, proclaim it, and live it. I have a little cross I bought at the General Assembly of the Christian Church (Disciples of Christ) in Nashville several years ago. 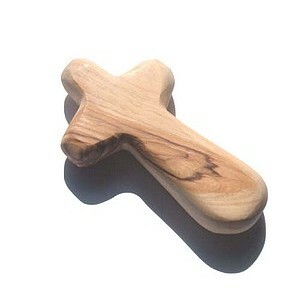 This cross is hand made and it is crafted to be held in ones hand. It’s shaped just perfectly. It nestles right in my palm ever so comfortably and I love to hold it when I pray and meditate. What impresses me about this cross is how beautiful it is. How smooth. Polished, refined. It is nothing like the cross Jesus experienced. His cross was not beautiful. It was coarse, hard, splintery, ugly. It was heavy, it was dark and it was raw. That cross spoke volumes about hate, conquest, mistrust, prejudice and suspicion. It was on that cross that Jesus would die a very painful death. My prayer cross is nothing like the cross Jesus experienced and yet my hand cross makes us think of Jesus’ cross. My cross has been transformed. I imagine that in the making of this prayer cross that it went through stages of being not the beautiful cross it is now. It started out formless, raw, unpolished. But it didn’t remain that way. Jesus also transforms our lives as he transformed the cross by his resurrection. He takes us, just as we are, and he makes our lives new again with wonderful possibility and hope. Jesus smooth’s out the rough places for us so we can love deeply, so we can serve gladly, and so we can be lifted up to understanding more of the divine power working in, through, and as our lives. Jesus wants our human experience to be an abundant one, each day feeling renewed in Spirit. Jesus calls out to us, in our rawness and in our doubt and heals us of all that separates us from experiencing the unconditional love of God. Jesus smooth’s out the roughness of our humanity, so our real spiritual nature can shine forth.